IP server built-into the camera. Easy installation for users of all levels with iCAMView Utility (a step-by-step installation wizard). View images from your web enabled PDA. Monitor multiple IPCamera using iMultiView (a Windows based freeware) when you make a purchase. Flexible Motion Detection and Image Recording functions. Configure up to 4 viewing time frames (Permit Hours). Able to display multiple images on a single screen. 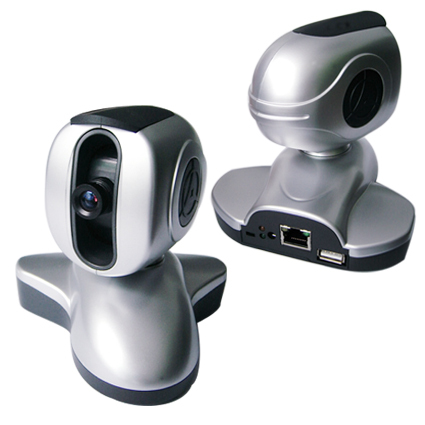 Support up to 30 simultaneous remote viewers per USB camera. Display viewer's IP, account, viewed camera, login time and total downloaded bytes. Detailed event log with listing options. Event listing by Level and Type. Limit the max FPS to each of the 8 user account. Block / black-list up to 256 IP addresses from accessing IPCamera. Schedule up to four time slots when motion detection is active. Upload motion detected images to a specified FTP server. Schedule up to two time slots for image forwarding (to email or FTP server). Update firmware directly from IPCamera webpage. Save current settings to a file making settings recall easy.